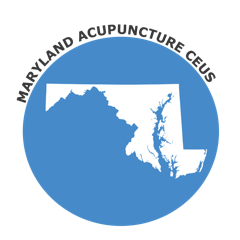 ACE is proud to offer Acupuncture CEU/PDA courses for Maryland Acupuncturists seeking to renew their license. Stay on top of your Acupuncture CE requirements and further your professional skills with ACE. Choose from a variety of different online courses pertaining to Acupuncture, TCM/Oriental Medicine, Herbs, Ethics, and Bio-Medicine subjects. We strive to make obtaining acupuncture CE online a seamless process, which is why you receive your certificate of completion immediately after passing the course. The State of Maryland accepts NCCAOM PDA or CEU courses to complete continuing education requirements. (f) Not more than 7 hours in published writing or articles in acupuncture and Oriental medicine that are: Peer-reviewed research or peer-reviewed clinically relevant articles in acupuncture and Oriental medicine; and Limited to 4 hours per article. (a) Pro bono work shall earn 1 credit hour for each 3 hours of pro bono activity up to a maximum of 7 credit hours per renewal cycle. (b) Pro bono work shall be for the provision of acupuncture services provided through an organization offering humanitarian services such as, but not limited to: Domestic or international victims in an emergency situation or disaster area; Low income or underserved areas or populations; Special needs populations; or United States military personnel. Upon completion of the pro bono work, the licensee shall obtain from the facility written documentation of completion of pro bono hours including: The name of the facility; The address where the pro bono work was provided; The type of work that was done; The number of hours of actual work provided for which the licensee desires credit hours; and a statement guaranteeing that the work provided no financial benefit to licensee. (3) Licensees shall maintain the documentation of their continuing education credits for 4 years from the date of their acupuncture renewal. (4) If requested by the Board, a licensee shall provide proof of continuing education attendance by providing documentation of: Name of the program; Date of the program; Number of continuing education hours earned; and Name of the sponsoring organization. The process of getting Maryland continuing education credits is simple, convenient, and easy: Download the course, finish the online quiz, and receive a certificate of completion immediately online. You can finish all your continuing education requirements on you desktop, mobile phone, or I-Pad. Reading material are printable. Courses are either in Written format or in a Live webinar. Visit our Acupuncture CEUs page to find out about any other state requirements. For additional details and information, please visit the Maryland Acupuncture Board website.